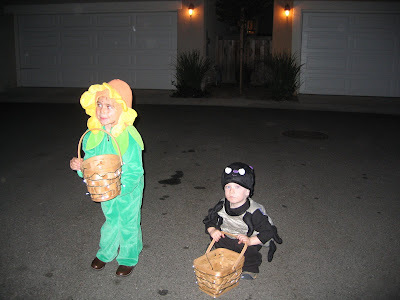 This year Madeline dressed up as a sunflower and Mason went out as a spider. Our theme was "Things You Find in a Garden". Every garden needs a scarecrow...and of course a gardener. Jay played tricks on some of the neighborhood kids. As they reached down for their treats from the basket, he "woke up" and scared them. Some of them ran away crying. It was fantastic! 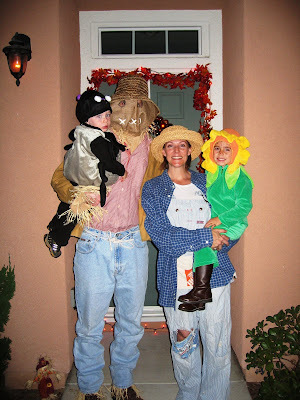 By far, he was the best looking scarecrow I've ever seen...or kissed for that matter! 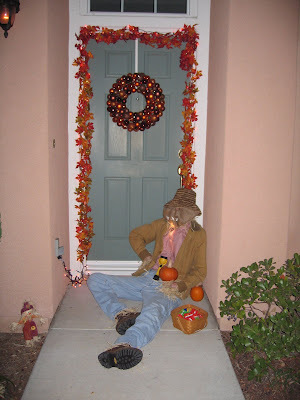 Loved the scarecrow! How funny that ahe scared the kids like he did. I can imagine how unsuspecting they must have been. Great job, Jay! The children were cute as the theme you chose.....for the Flower family! And Steph, the mastermind! You are so creative! You go, mom! 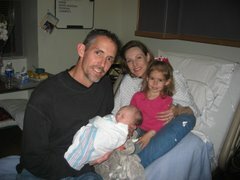 I loved the photos, thanks for submitting them.